Today, the most prevalent IT journey is to cloud and Infrastructure as-a-Service (IaaS). And within IaaS, data protection accounts for the most common use case, according to Enterprise Strategy Group. In this blog post, I'll share how to chart your progress on your cloud journey with respect to data protection and how to overcome potential roadblocks. Whether your enterprise is still resisting public cloud, or you're already "cloud-first", we'd like to share how we can help! 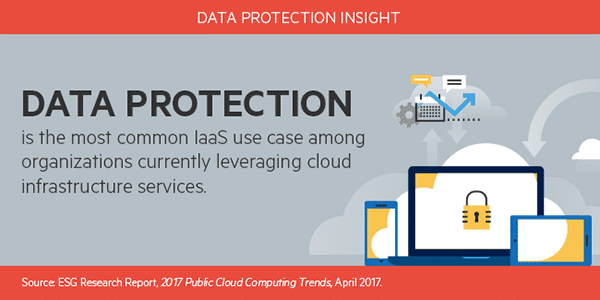 According to today's ESG "Data Point of the Week", data protection accounts for the most common IaaS use case. Despite significant gains, a study commissioned by Intel Security revealed that some organizations still express lack of trust for public cloud. Zero-touch operation: Igneous handles all monitoring, troubleshooting, and software updates, so you don’t have to! Scalability: Igneous Hybrid Storage Cloud scales from 100TB to 100PB and beyond, utilizing our patented RatioPerfect™ architecture. Cloud economics: Built from first principles of cloud management, cloud system architecture, and cloud native services, Igneous Hybrid Storage Cloud delivers cloud economics in your data center. Getting Started with Public Cloud? Once public cloud gains acceptance in your enterprise, getting to the "just right" use of public cloud is often challenging. Some enterprises struggle to identify the best candidates for data to move off premises. At others, IT team members don’t have time to explore public cloud options because they’re so busy fulfilling end user-generated help tickets. Still others pay costly data access fees from public cloud providers because of unexpected restores back to on-premises systems. Igneous Hybrid Storage Cloud helps generate a fast return on investment (ROI) with intelligent tiering to public cloud. Igneous File Insights: Analytics can help identify candidates to move off expensive performance tiers onto lower cost storage. End user self-service: End users can directly access archives, eliminating unwanted IT tickets for archiving or recovery of data. No extra third party licensing: Igneous provides application software built into our infrastructure to migrate, log and index data — without expensive licensing of third party backup or archiving applications, such as those offered by Commvault or Veritas. Igneous File Insights provides analytics about data to archive. As different public clouds emerge, some organizations look to diversify risk, while others aim to take advantage of the unique capabilities of each cloud provider’s tool chain. Others want to build cloud-native capabilities on premises. The challenges for those administering data is knowing where the data is and tracking data movement. Igneous Hybrid Storage Cloud provides a unique data management platform to simplify the management and discovery of data across hybrid or multi-clouds. Fast Search: Igneous Hybrid Storage Cloud provides indexing and search across data stored in the primary performance tiers, on-premises secondary storage, and public cloud. Rich metadata: Behind Igneous Hybrid Storage Cloud is a robust object storage platform, capable of storing not only traditional file metadata but also relevant attributes that track data movement. Event-driven Computing: Igneous Hybrid Storage Cloud maintains a persistent event stream so all data can be logged for forensics and trigger microservices to transform data or enforce policy. While public cloud can offer interesting benefits, some enterprises far along on the cloud journey have begun to revisit the economics of cloud, both the immediate cost savings and the more long-term efficiency gains. Igneous Hybrid Storage Cloud helps in this stage of the journey as well by offering several benefits that decrease cost and increase agility. Cloud benefits without the unpredictable costs: While cloud providers offer both aggressive and transparent pricing, unexpected costs associated with data access and networking charges can add up. Igneous Hybrid Storage Cloud provides predictability, as you don’t get charged either for accessing your own data or for utilizing your own networks inside your datacenter. Control of your data: With Igneous Hybrid Storage Cloud, you have a central point of control for your entire secondary storage tier, no matter where the data lives. Future-proof platform: While your original usage for Igneous Hybrid Storage Cloud might be for secondary data, Igneous Storage is also an ideal platform for your primary data. With native support for S3 API and a persistent event stream for serverless computing paradigms, Igneous Storage is designed for cloud-native applications. No matter where you are on your journey to cloud, Igneous brings a modern approach to secondary storage needs. If you're interested in learning more, please contact us or check out our Product page!